This beautiful unit is one of Amazon’s best selling chlorine generators. 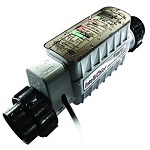 The Pentair IntelliChlor IC20 is approved by the National Sanitation Foundation and features push button operation and full diagnostic capabilities including cell life tracking, salt levels, and water temperatures. Appropriately, the cell unit has water proof electronics. This is one of the only chlorinators that has the control panel/unit and cell as one unit. You’ll also need to purchase the IntelliChlor Power Unit to go along with this unit. Models IC20, IC40 & IC60 are designed to service pools with capacities of 20,000, 40,000 & 60,000 gallons respectively. The guess work has been taken out of pool maintenance with the IntelliChlor tracking performance data on daily basis. It gives the pool owner all the information they need to make informed decisions and keep the water quality at its optimum. Like most chlorinators these days, the Pentair Intellichlor IC20 is features reverse polarity which reduces calcium build up on the plates. The manufacturer calls it on-time cycling which basically means that the poles are switched every certain number of hours of operation. Even so, the cell plates sometimes require manual cleaning. There’s an indicator light which will tell you when the cell is dirty and needs cleaning. The cell will need to be removed and cleaned in an acid solution when the indicator light comes on. The Pentair Intellichlor IC20 captures information that includes production settings, hours of operation, water temperature, salt readings, cell cleaning cycles, and chlorine output. You’ll know everything you need to know about the unit’s operation and your pool water. The unit is simple to operate and has clear displays and controls. In addition if has an automatic shut-off function should the water temperature become too low for safe cell operation. Reverse polarity reduces calcium build-up and prolongs cell life. It can also communicate with IntelliTouch, EasyTouch and SunTouch automation systems. Pentair warrants its unit for a period of 1 year and it is a limited warranty covering parts only. Some reviews on Amazon indicate that some have had trouble with their units within the warranty period and Pentair wouldn’t cover the issues under warranty. 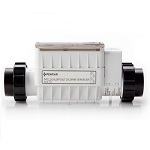 Please be aware you will need to purchase the Pentair IntelliChlor Power Center to power and connect to the IntelliChlor series chlorinators.